Anne Hathaway Courted by Hugh Jackman for "Les Miserables"
Hugh Jackman wants to do "Les Miz" so badly that he's pushed back "Wolverine 2" to do it, and now he's trying to get Anne Hathaway to join him. Hathaway is being sought to take the role of Fantine in director Tom Hooper's "Les Miserables," accoridng to Broadway World. The idea seems to have been born of Hathaway's serenading of Jackman with a riff on the show's hit song, "On My Own" during this year's Oscar show. Jackman is already on board to play the hero, Jean Valjean, and Russell Crowe is slated to play Inspector Javert, the cop who hounds the bread thief across the years. As to Fantine, she was joy itself. Her splendid teeth had evidently been endowed by God with one function - that of laughing. Her thick blond tresses, inclined to wave, and easily escaping from their confinement, obligated her to fasten them continually. Her rosy lips babbled with enchantment. The corners of her mouth, turned up voluptuously, seemed to encourage audacity; but her long, shadowy eyelashes were cast discreetly down towards the lower part of her face as if to check its festive tendencies. Her whole toilette was indescribably harmonious and enchanting. Fantine was beautiful, without being too conscious of it. She possessed two types of beauty - style and rhythm. Style is the force of the ideal, rhythm is its movement. With a little peroxide we can definitely see Hathaway fitting the bill, and she's got the pipes, though we had no idea teeth could laugh. As we discussed last week, it's been a long time since Hathaway had a major in a film that succeeded commercially or critically, and we're not sure this project would help her break out of her rut. 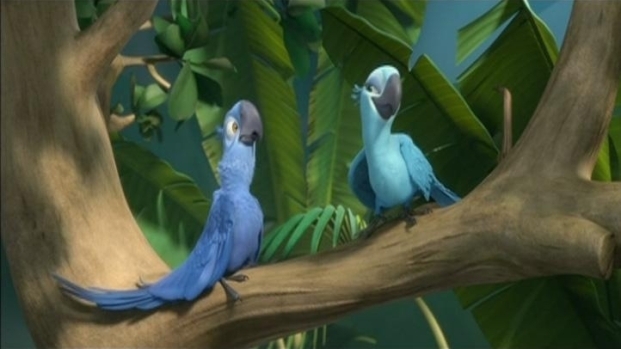 A rare macaw named Blu (voiced by Jesse Eisenberg) is brought from his home in Minnesota down to Brazil to mate with Jewel (Anne Hathaway), who instead has designs on escaping from her cage. Opens April 15. Also, we're not sure the world needs yet another adaptation of this story.